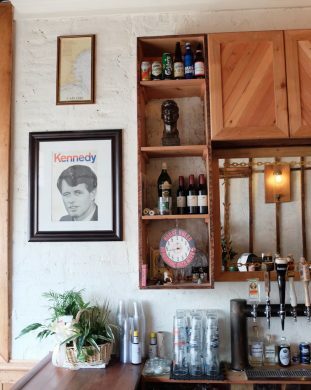 Near the Knickerbocker M, a new bar called Darlings opened up early last month. From the brain of Montana Masback of Montana’s Trailhouse and Twin Suns Deli, and his collaborator Daniel “Fence” Heanue, Darlings is a “cozy pub” that could very well become your new neighborhood haunt. Firstly, if you’re a football fan in Bushwick, this could become your go-to… Or your enemy. Boston-born Heanue has a particular soft spot for the New England Patriots, and on the weekends this pride shines bright. “Come Patriots time, it is very much Patriots time,” he declares. Heanue explains the bar is by no means a “sports bar,” despite playing basketball and hockey on the weekdays and football on the weekends, effectively quelling any fears one might have of suffocatingly bro-y vibes. The place is “very much a socializing bar,” with “party vibes” on the weekends when local DJs come in to spin. Still, fans of weekend football will no longer have to choose between that and weekend brunch. 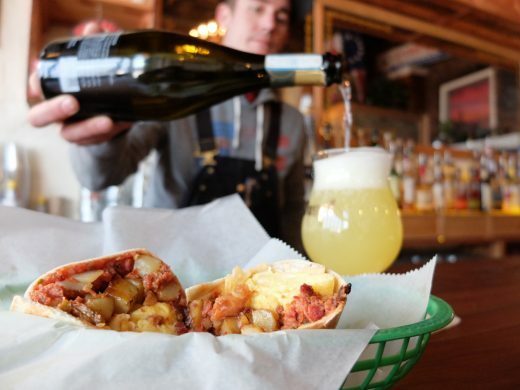 For just $25 on Saturdays, you can get either a breakfast burrito or breakfast sandwich along with an unlimited dose of mimosas. Drink up! 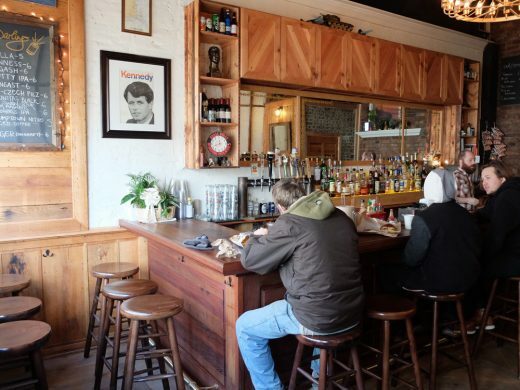 Heanue describes the cash-only bar’s design as a place that could have been built “150 years ago,” featuring a lot of rustic-looking wood, including a bar surface constructed from a Queens water tower. Darlings is fairly no-frills, offering the standard selection of beers as well as an array of rotating local selections, mainly from breweries in New York or New England. 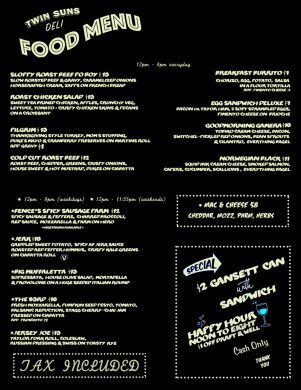 Prices range from $3-6 for cans, $5-6 for drafts, and $6 for a ‘Gansett and shot. Not only do they have a happy hour from noon to 8 pm (a buck off any beer or well drink), on Tuesday nights there’s a 2-for-1 deal on Budweiser and well drinks. Oh, there’s also Jägermeister on tap. Heanue cultivated a taste for it during his time at The Acheron (RIP). Initially put off by the drink’s “fratty” reputation, he soon fully changed his mind, and even got a Jäger tramp stamp tattoo after someone dared him to. There’s also stuff to snack on during the week. Darlings serves food from Twin Sun Deli, a convenient collaboration when the food-bearing establishment is literally next door and the bar shares an owner with it. 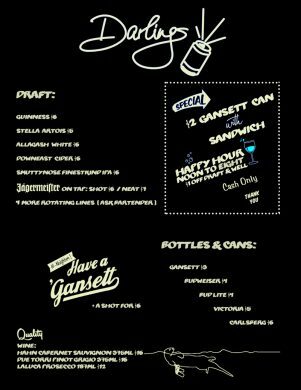 Choose from sandwiches of all sorts or mac n’ cheese, and with the purchase of a sandwich, you can score a can of ‘Gansett for just $2. In the midst of all this consumption, just remember to look up once in a while. Plus, their Facebook indicates that they would love to host any last-minute holiday parties, so hit them up if you’re in need. Darlings, 242 Himrod Street at Knickerbocker Ave, Bushwick. Update, December 9: The original version stated that a brunch special was served on Sundays. It is actually served on Saturdays.